After months of rumours and gossip, Samsung has just unveiled its follow up to the wildly successful Galaxy S4, the Galaxy S5. Packing a load of new camera tech, a fingerprint scanner and some innovative health features, could this be your next upgrade? To get the full picture of just how well specced the Samsung Galaxy S5 is, we've put it head to head with its main rival, the iPhone 5s from Apple. Also, make sure you check out our hands on Samsung Galaxy S5 review, straight from the show floor. V the latest Galaxy device have what it takes to topple Cupertino's baby? Read on and find out. Article continues after the video. A bit like the jump from Samsung Galaxy S3 to Galaxy S4, the design changes in the S5 are more of an evolution than the a revolution. In fact the best comparison would be look at the Samsung's other flagship, the Galaxy Note 3. The bulk of the device is still plastic, even the metal styled ribbon around the rim is plastic. Moving round to the back there's a leather styled rear, complete with a pinhole design. Weight wise the Samsung Galaxy S5 comes in at 145g and measures 142mm x 72.5mm x 8.1mm, a fair bit bigger and heavier than the iPhone 5s. Apple's flagship weighs 112g and measures 123.8 mm x 58.6 mm x 7.6 mm, though of course you do have to take into consideration that the iPhone boasts a much smaller display. While we mentioned that Samsung's design for the new Galaxy S5 was iterative, the same can easily be said for Apple's move from iPhone 5 to iPhone 5s. Everything from the curved and chamfered edges, to the two tone back and the aluminium construction were carried over, though we have always been impressed with the premium materials used by the Cupertino based company. Both phones come in a choice of colours, with the Samsung Galaxy S5 arriving in charcoal, blue, gold and white and the iPhone already available in Space Grey, silver and gold. Both the iPhone 5s and the Galaxy S5 offer very different specs when it comes to display, with Samsung choosing to kit its newest offering out with a Full-HD, Super AMOLED screen measuring 5.1-inches. Android phones in general have always stuck to the larger screen sizes, with the iPhone sticking to the more pocket friendly 4-inch size. Samsung has again crammed a lot of tech into powering its latest flagship, including 2GB of RAM (surprisingly less than the 3GB in both the Galaxy Note 3 and Sony's Xperia Z2) and a quad-core Krait 2.5GHz chip. However, unlike the iPhone 5s, which features an Apple A7 processor and 1GB RAM, the new Galaxy S5 is still 32-bit, as opposed to 64-bit. While this won't cause any day to day issues, it does raise some questions about future support once 64-bit processors are common place amongst Android devices. Both these phones really go full force in touting respective camera tech, whether it's the amount of megapixels, nifty software tweaks or the low-light performance. In terms of megapixels, the Samsung Galaxy S5 packs 16 in its rear snapper and 2 up front, which sounds more impressive than the 8-meg version on the back of the iPhone 5s. Samsung is also touting a new HDR mode that should provide more realistic looking skin tones, along with a super fast auto-focus that takes just 0.3 second to lock on to its target. Another particularly cool feature is Selective Focus, which allows you to achieve snaps with a shallow depth of feel effect, similar to those captured on pricey DSLRs. UHD video recording is also a new feature. Apple's iPhone 5s also has some tricks tucked away in its camera bag, including a True Tone flash for realistic skin tones in darker environments, a Sapphire crystal lens cover, ƒ/2.2 aperture and a backside illuminated sensor. It can also shoot slow-motion video, if you fancy getting a bit creative. We already know that the camera on the iPhone 5s takes some fantastic snaps, but we'll have to give the Samsung Galaxy S5 a thorough test out before we know just how well its camera can perform. Now, this is where it gets juicy. Both these high-end, high-specced and high-priced devices come boasting some really interesting features, but as it's new, let's kick off with the Samsung Galaxy S5. Winning top billing on Samsung's new superphone is an array of health features, collectively labelled S-Health 3.0. Tools in this package include a pedometer, personal fitness tracker and a new way to keep up to date with your diet, but the most innovative clearly seems to be the built-in heart rate monitor. Positioned just below the camera sensor on the back, this lets you touch your thumb against it and instantly be notified of your heart rate. Clever. Apple's iPhone 5s also includes some smart fitness tech, by way of the M7 coprocessor, which can keep a track of your movement, though Apple doesn't include any default apps for this. Check out our round-up of the best Android apps to download in 2014. Another new addition to the Samsung Galaxy S5 is the fingerprint scanner positioned on the home button. After Apple revealed its iPhone 5s was supporting a similarly placed scanner, it was only a matter of time before it became the norm. Samsung has struck a 'global partnership' deal with PayPal to provide payments via fingerprint reader verification in 26 markets. It'll be interesting to see the details on the ground in terms of who and where this will be accepted, but at least eBay shopping is likely to be slightly more secure. Unlike the iPhone though, Samsung has ensured the S5 is a little bit more rugged, by having it IP67 certified. What does this mean? Basically it means the device is dustproof and waterproof in depths of up to 1m. It is hard to compare the two devices in terms of software as they are both so radically different. 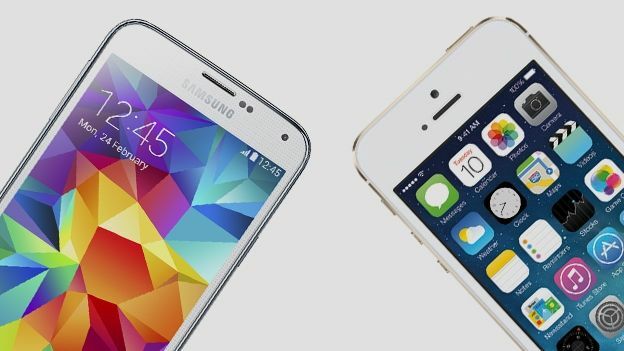 The iPhone runs iOS7, while Samsung's Galaxy S5 is powered by Android 4.4 Kit Kat with the TouchWiz UI overlay. This UI remains pretty much the same as last year, though there has been some slight tweakage of the notification tray and lock-screen, it definitely doesn't seem to be the massive redesign we were all hoping for. The Samsung S5 comes fitted with a 2800mAH battery, which should be good for a day's data and talk – pretty normal for a phone these days. On average this is about how much juice we can eek out of an iPhone 5s. We'll have to put the S5 through it paces more thoroughly, though we can imagine you'll still need to plug it in every night. As you'd expect for 2014, both these flagship devices come equipped with LTE functionality for super speedy 4G data, Bluetooth 4.0 and WiFi. The Galaxy S5 though supports fifth generation WiFi 802.11ac, while the iPhone is still stuck using the slightly older 802.11a/b/g/n bands. Samsung has also kitted the S5 with a neat piece of software called Download Booster, which should ensure you're always using the fastest connection available. These two phone behemoths both have lots going for them, whether it be the innovative health features on the S5, or the camera tech on the iPhone 5s. However, both these phones lack of real innovation in terms of design does seem to be a little bit of a backward step. We'll have a full review of the Samsung Galaxy S5 up when we've had enough time to fully test out the new device. In the meantime, check out the hands on Samsung Galaxy S5 review and our round up of the best Samsung Galaxy S5 cases. Samsung Galaxy S5 vs Samsung Galaxy S6 and S6 Edge: What's changed? Sammy has embraced design, but how does the S6 and S6 Edge compare the S5? Apple iPad Air 2 vs Apple iPad Air: Should you upgrade? Apple iPhone 6 vs Apple iPhone 5s: What's changed? It's finally here! But should you upgrade right away? How does the new Note 4 compare to the outgoing Note 3? HTC One M8 vs HTC One: which phone should you buy? Does the new HTC One M8 make a worthy upgrade? HTC One M8 vs Apple iPhone 5s: Which phone should you buy? Can the new HTC One overpower Apple's iPhone 5s? HTC One M8 vs Samsung Galaxy S5: Which is the best?